Book 1 of The Soul Screamers series -- My Soul to Take -- was released this past summer, and readers found out why Kaylee Cavanaugh screams bloody murder when someone’s about to die. Review: I'd like to start by apologizing to Chelsy who sent me this book. I said I'd have a review up by the 1st, but I failed. *sigh* but here it is now. This book was pretty good, when it wasn't focusing on the sexual tension between the two main characters. When ever it got to those parts I just found myself skimming. Luckily, it wasn't a HUGE part of the book, though it was prevalent. Another thing that bothered me was what they called the banshee's bean sidhes. But I don't really want to talk much about that, since I understand why the author wanted to do it. But, all in all, those were the only things that bothered me. I liked the story, but didn't love it. It's nothing that will WOW you, but it's not bad either. Note that it is about demons and death, and I know that bothers some people. It worked really well as a stand-alone book. This is the second in a series, but I didn't feel like I was missing anything (I haven't read the first). That's one of the biggest compliments I can give to a book. 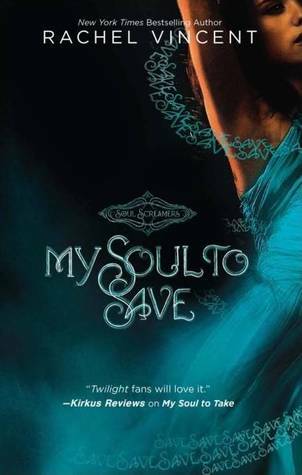 0 Response to "My Soul to Save-- Rachel Vincent"